Background: The Texas Association of Surgical Skills Laboratories (TASSL) is a state-wide, non-profit consortium of surgical skills training centers for all of the accredited surgery residency programs in Texas. 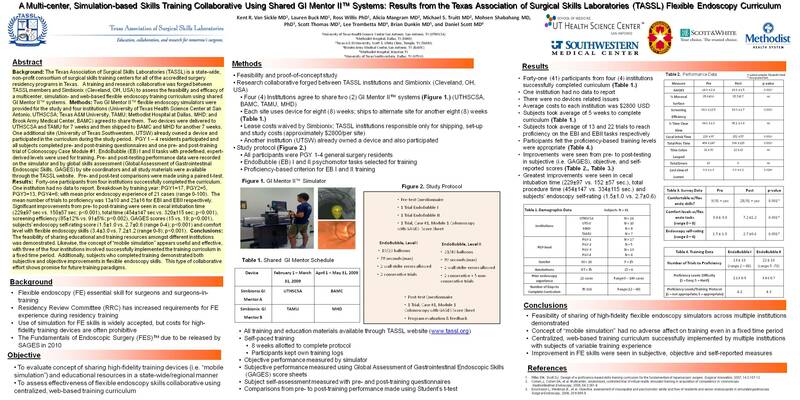 A training and research collaborative was forged between TASSL members and Simbionix (Cleveland, OH, USA) to assess the feasibility and efficacy of a multicenter, simulation- and web-based flexible endoscopy training curriculum using shared GI Mentor II™ systems. Methods: Two GI Mentor II™ flexible endoscopy simulators were provided for the study and 4 institutions (UTHSCSA, TAMU, MHD, and BAMC) agreed to share them. Two devices were delivered to UTHSCSA and TAMU for 7 weeks and then shipped to BAMC and MHD for another 7 weeks. One additional site (UTSW) already owned a device and participated in the curriculum during the study period. PGY 1 – 4 residents participated and all subjects completed pre- and post-training questionnaires and 1 pre- and post-training trial of Colonoscopy Case Module #1. EndoBubble (EB) I and II tasks with predefined, expert-derived levels were used for training. Pre- and post-testing performance data was recorded on the simulator and by global skills assessment (GAGES) by site coordinators and all study materials were available through the TASSL website. Pre- and post-test comparisons were made using a paired t-test. Results: Forty-one (41) subjects from four (4) institutions successfully completed the curriculum. One (1) institution had no data to report. Breakdown by training year: PGY1=17, PGY2=5, PGY3=13, PGY4=6; with mean prior endoscopy experience of 21 cases (range 0-100). The mean number of trials to proficiency was 13±10 and 23±16 for EBI and EBII respectively. Significant improvements from pre- to post-training were seen in cecal intubation time (229±97 sec vs. 150±57 sec; p<0.001), total time (454±147 sec vs. 320±115 sec; p<0.001), screening efficiency (85±12% vs. 91±5%; p<0.002), GAGES scores (15 vs. 19; p<0.001), subjects’ endoscopy self-rating score (1.5±1.0 vs. 2.7±0.6 (range 0-4); p<0.001) and comfort level with flexible endoscopy skills (3.4±3.0 vs. 7.2±1.2 (range 0-8); p<0.001). Conclusions: The feasibility of sharing educational and training resources amongst different institutions was demonstrated. Likewise, the concept of “mobile simulation” appears useful and effective, with three of the four institutions involved successfully implemented the training curriculum in a fixed time period. Additionally, subjects who completed training demonstrated both subjective and objective improvements in flexible endoscopy skills. This type of collaborative effort shows promise for future training paradigms.